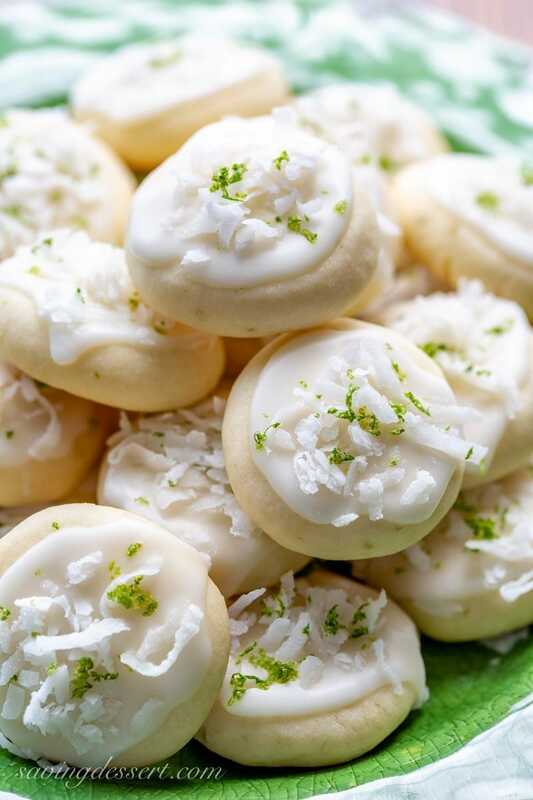 Coconut Key Lime Meltaways – a light and buttery bite-sized cookie with a big tropical flavor. What a terrific flavor combination in one sweet little bite! There cookies are called meltaways for good reason. They truly melt in your mouth and are dangerously easy to pop in there, one after another. The delicious cookie dough is tender with a shortbread-like texture. The cookie flavor is buttery with a zing from the key lime zest and juice, and a hint of coconut from the extract and shredded coconut on top. While the cookie dough is not very sweet, it takes on the simple icing and shredded sweetened coconut perfectly. 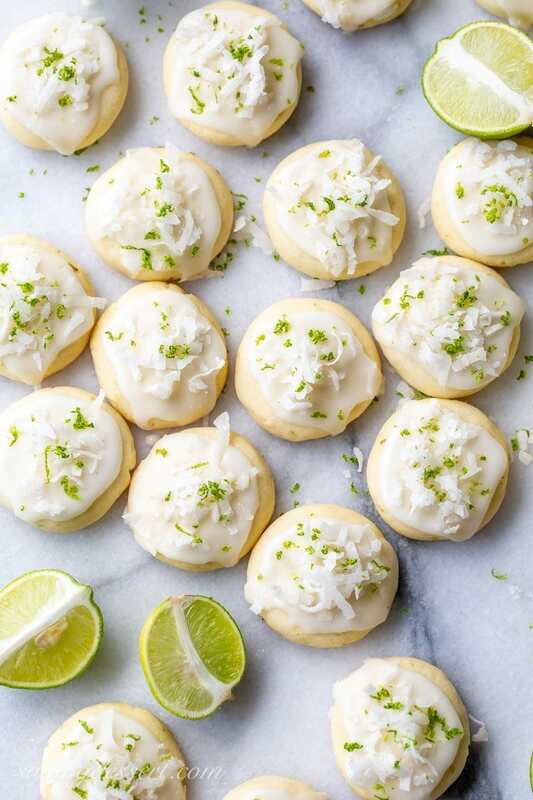 We use fresh Key Limes for this recipe but if you can’t get find them in your stores, the cookies will still be great made with regular limes. Don’t skip the extra zest on top however! Every component from the zest to the coconut works together to give you the full meltaway tropical experience! These cookies are very easy to make and store well once the icing dries. 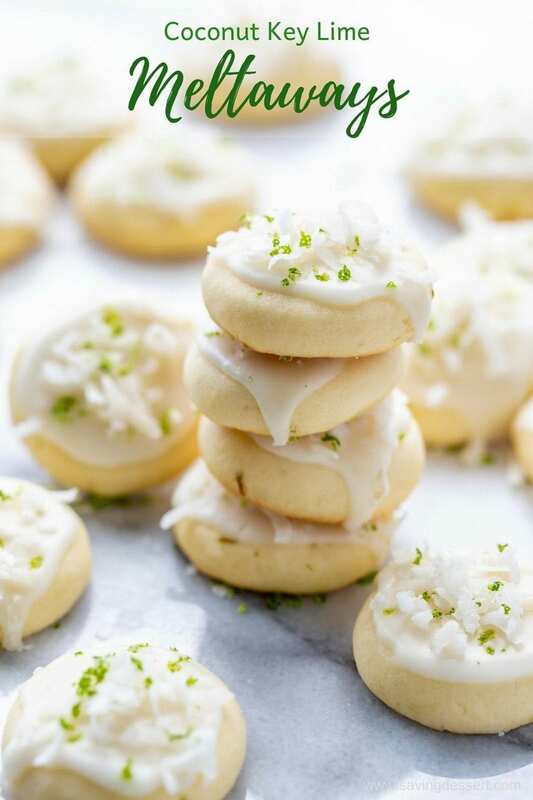 You may not need to worry about storing them for long however, as these Coconut Key Lime Meltaways are addicting! Let’s be baking friends! If you try our recipe please leave a comment, and photo if you have one, on Pinterest. If you share on INSTAGRAM use the hashtag #savingroomfordessert so we can stop by and give your post some love. And we’d be so happy if you would FOLLOW Saving Room for Dessert on FACEBOOK| INSTAGRAM| PINTEREST | TWITTER and subscribe to our YOUTUBE channel for all the latest recipes, videos and updates. In a large mixing bowl, beat the butter on medium speed until creamy. Add 1/2 cup of powdered sugar and beat until light and fluffy. Scrape down the sides of the mixing bowl and blend again until incorporated. Add 1 tablespoon of lime zest, 2 tablespoons lime juice and 1/2 teaspoon coconut extract. Gently mix on low until incorporated, scraping down sides with a spatula as needed. In a small mixing bowl, whisk together the flour, cornstarch and salt. Add the flour mixture in four batches to the creamed butter and lime mixture. Blend on medium-low until each addition is incorporated. Scrape the dough into a ball, cover the bowl with plastic wrap and refrigerate for 1 hour. To bake the cookies, preheat oven to 350F. Line a baking sheet with parchment paper. Scoop a level spoonful of dough using a 1-inch cookie scoop. Roll each into a tight ball and place two inches apart on the prepared baking sheet. Press each dough ball gently with the flat bottom of a small glass or measuring cup to the desired thickness. Bake for 13 minutes at 350F or until lightly browned around the edges. Slide the parchment paper onto a wire rack to cool. Repeat with a new piece of parchment paper placed on a cooled cookie sheet. Cool cookies completely if planning to top with icing. Alternatively, you can also toss the warm cookies in powdered sugar instead. Whisk together 1 cup of powdered sugar, 1/2 teaspoon coconut extract and the remaining 2 tablespoons fresh key lime juice. Add more lime juice or sugar as needed to reach the desired consistency. 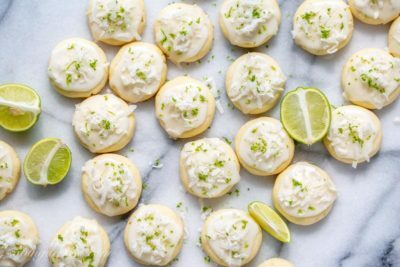 Spread the icing on the cooled cookies and immediately top with shredded coconut and lime zest. Allow the icing to fully set then store the cookies in a cool location or refrigerate for longer storage. 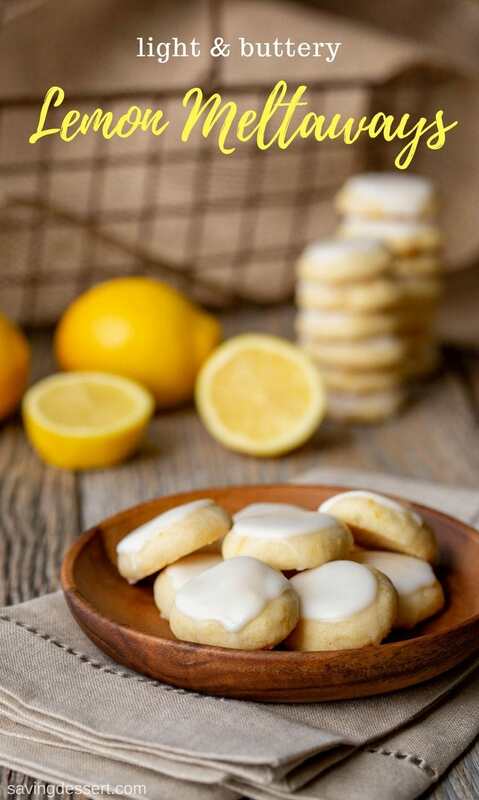 Lemon Meltaways – a light and buttery little bite of sunshine! The perfect cure for when you need a little something sweet. 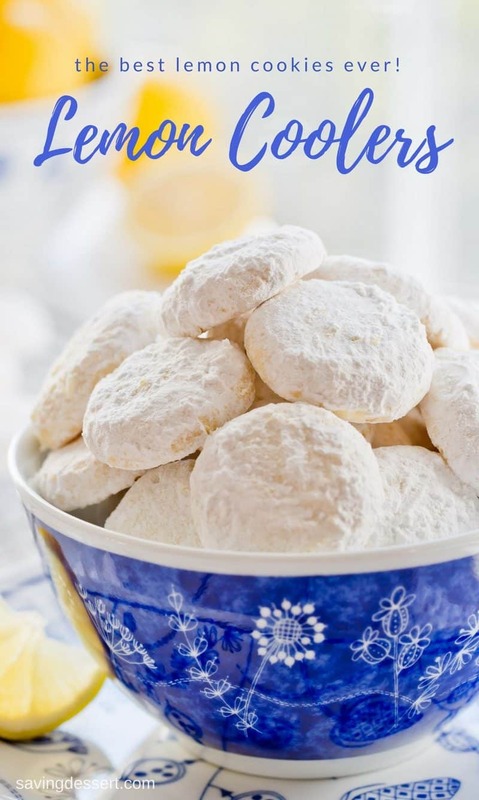 Lemon Coolers – hot from the oven, these melt-in-your mouth cookies are tossed in a mixture of crystallized lemon and powdered sugar for the most incredible intense lemon flavor ever! 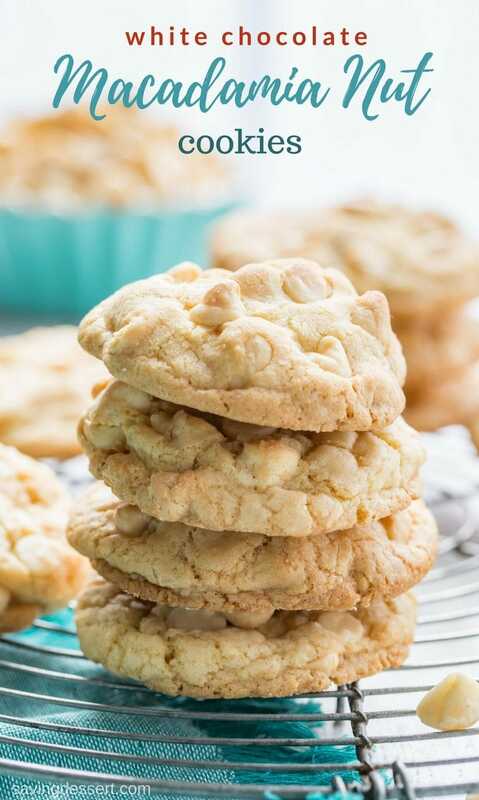 White Chocolate Macadamia Nut Cookies with Coconut – this cookie is a shinning star of the dessert tray! Delicious jumbo-sized thick and chewy cookies that rival any from the gourmet bake shop. If you decide to purchase something at Amazon after following my affiliate link, I receive a small commission, at no additional cost to you, which I use to pay for web hosting and services for this blog. Thanks for supporting SRFD! I love lime and coconut together, and if you do too you’ll want to check out this creative, easy Lime Coconut Buttermilk Pie from Lori at RecipeGirl. My mouth is watering over these lovely Coconut Lime Squares from Sue at The View from Great Island. Think tropical vacation in every bite! And finally, for a savory treat be sure to try this Spicy Coconut & Lime Grilled Shrimp Scampi recipe from Cheryl at TidyMom! These are absolutely beautiful cookies! Love your photos. Hi Becky – this recipe makes about 36 cookies. I’ve always loved regular lime meltaways, but adding coconut is another story! Yum! Me too Jennifer – thanks! What a delicious looking cookie Tricia, I love to have one right now. Pinned! I think the last time I made lime meltaways was way before I was blogging. This is a delicious reminder to add them to my baking list! Pinning! Such a great cookie Liz – thanks! I’ll have to go check her recipe out Monique – thank you! I saw these on facebook and rushed right over, they look incredibly refreshing, what a perfect flavor for a summer cookie! My mouth is watering! I haven’t baked any cookies in a while…these look so tempting with coconut and lime. Gorgeous shots, Tricia. Thanks Angie – we find them very tempting. Thank you and happy Friday! Just reading your first paragraph made my mouth start to water and that was before the pics had even loaded. That is the sweetest comment Larry – thank you. Safe travels!